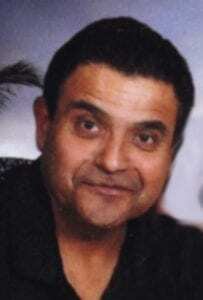 Henry “Ricky” Castillo was born August 7, 1957 in Seagraves and was called home on March 24, 2018 at the age of 60. He is survived by his wife Rachael; daughter Wendy; son Henry Ricky “Kiki” Jr., and wife Judy; two granddaughters AnaZiel and Bella Yazmine; two step-grandchildren Ross and Keatlynn; mother Lillie Chapa; sister Irma and husband Ramiro Ramos; brother Arthur Castillo, wife Janie, Gene Castillo and wife Hopie. He also leaves behind numerous uncles, aunts, nieces and nephews. He is preceded in death by step-father Domingo Chapa; father Ysidro Castillo; sisters Lillie Gallegos, Mary Tijerina; father-in-law Ralph Lambaria; mother-in-law Virginia Lambaria; brothers-in-law Santos Caballero Sr., Joe Fred Cerda and John H. Lambaria. Visitation was Tuesday, March 27 at 5 p.m. at St. Andrew Catholic Church, a rosary followed at 7 p.m. Mass will be celebrated Wednesday, March 28 at 10 a.m. at St. Andrew Catholic Church with burial to follow at Esparza Cemetery.